I play a lot of "Words With Friends" (WWF) these days. In case you've been dwelling in a cave for the last few years, WWF is a ripoff of Scrabble (so close that I'm surprised there hasn't been a patent infringement lawsuit) played on Facebook or smart phones or tablet devices. My brother, David, is my most frequent and most tenacious opponent. He works for himself from home, so he can take as much time as he feels like to study out the perfect move. He routinely trounced me when we started playing, but in the last few weeks I have achieved something close to parity with him. For the most part, there isn't much poker-like reasoning in WWF. There's just no way to know what tiles your opponent might have, except when they've all been distributed and you're on the last few moves of the game. But a couple of weeks ago David and I played a game in which thinking one level deeper than he did made all the difference between winning and losing. Through the first half of the game, we had stayed entirely within the bottom half of the board. This wasn't planned; it's just the way it worked out when each of us took our most advantageous moves. But then something strange happened: He passed a turn. He had never done this before, except at the very beginning or very end of a game when he had no possible moves. He had occasionally done a tile exchange instead of placing tiles. But just outright skip a turn? Unheard of. It puzzled me, but I didn't spend much effort trying to figure it out. I wrote it off as an anomaly, and just made my next move. WTF? Now he had my full attention. It was time for some poker hand-reading skills. One of the keys to high scores in the game is making "bingos," a term borrowed from Scrabble, in which you play all seven of your tiles at once. This not only makes big words, but you get a 35-point bonus for the feat. If you can do that across a double-word or triple-word square, so much the better. David's game centers on two strategies: Making high-scoring bingos, and blocking the avenues I might use to do the same. If he had one or two tiles in his rack that made bingoing difficult (letters like J, X, V, and K tend not to lend themselves to flexibility in making words), he would play those where he could, hoping to replace them with letters of high bingo potential--vowels and easy-to-use consonants like N, D, and S. I had seen him do this hundreds of times. If he were really stuck with a completely unusable set of letters, he would trade in a few to gain playability. What on earth would prompt him to just skip a turn? As I thought about it, there was only one logical explanation: He had a perfect rack for making a lot of different bingos, but had no "hook" on which to attach any of the possible letter combinations he could make, because our game had become so constricted in the lower half of the board. He must be thinking that the lower half was played out, and I would very soon be forced to make the first extension into the upper half, at which point he could stick a bingo onto nearly anything I put out there. Upon deducing that, my counter-strategy became obvious. It's the same as it is in poker: Once you know what your opponent wants you to do, you do the opposite. So I did. I played one and two letters at a time, finding all the little nooks and crannies in which I could add a tile or two to the already-crowded bottom half of the grid. I was passing up opportunities for higher-scoring plays that I could make if I ventured north, but I was getting free turn after free turn without David scoring any points, so I was happy to continue. I came to think of myself as Brer Rabbit in the briar patch, not wanting to come out where Brer Fox could eat me. Or you could think of me as the tortoise, progressing slowly while the hare was taking a nap. I knew that David must be thinking, after each turn, "OK, that's it, he has played all he can down there." Of course, he had good reason to think that. Every time I took a turn, I reduced the number of playable spots even further, so his expectation that I would be forced out of the thicket become inexorably closer to being true. Because of this, I knew that he wouldn't deviate from his plan. With each successive round, it made even more sense for him to skip another turn, because it was ever more likely that I would have to abandon my small-ball strategy. But he badly underestimated how long I could keep playing by myself. I didn't keep track, and the game was now too long ago to be able to retrieve the history, but I'm sure I got at least 15 turns in. He was likely guessing, at first, that I could go no more than two or three. Eventually, of course, I had indeed filled up every spot that I possibly could, and had to stick a line of letters up into virgin territory. He promptly laid down a bingo, as I was sure he would. But it was too little too late. My extended stay down in the land of the little scores had inflicted the death of a thousand cuts. Picking up five or ten points at a time had both given me an insurmountable lead and depleted the supply of available tiles. The game was over a couple of moves later. He texted me, "That didn't work out the way I had planned." I asked him to explain his unprecedented tactic (as if I didn't already know it). He told me precisely what I had deduced: He didn't want to wreck his high-flexibility board by playing one or two tiles at a time, thus risking picking up a tile that would impair the bingo potential, and instead decided to wait for me to create a hook for him to make a big score off of--but I didn't cooperate. I told him that I had guessed that that was exactly what was happening, and that I had intentionally devised a way to foil his nefarious plot. He replied that it was not nefarious, but, in fact, a grand and glorious plan, "opposed only by evildoers who hate America." That gave me a genuine LOL. He is always a good sport, win or lose. Would I have figured out what he was doing if I hadn't played so many hours of poker? Maybe. It's hard to say. But what I'm certain of is that it was poker experience that gave me the reflexive impulse (1) to crack the code of his line of play, (2) to infer from it what sort of tiles he was holding, (3) from that to project what he must be thinking about what I would do, and (4) figure out a way to frustrate his intentions. That, my word-playing friends, is pure poker. John Vorhaus, in Card Player magazine column, on playing suited connectors, May 2, 2012 (vol. 25, #9), page 50. Know how suited connectors win? 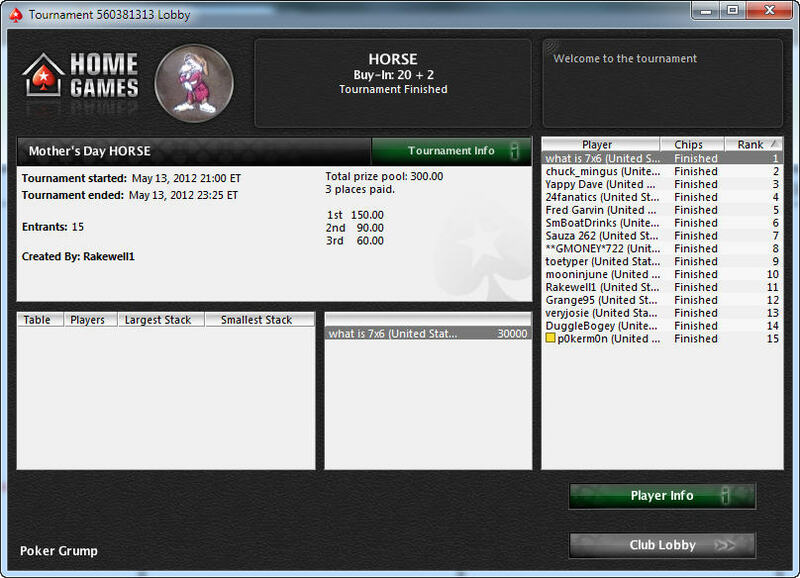 By betting the flop and having nobody call. That's pretty unlikely in a multiway pot, but much more likely when the pot is shorthanded or, in the best case, heads up. Then your 8-7 suited wins without a fight. You don't have to make a hand to win. You could have 8-7, 2-7, a pair of chickens, whatever. Here it is in a nutshell, folks: Since it's hard to make a hand in hold'em, your best outcome is not making your hand. Your best outcome is winning without a hand. 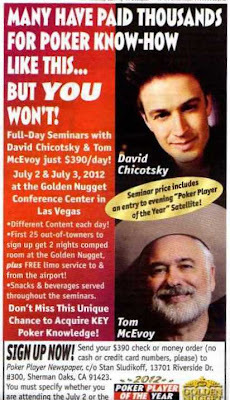 I noticed this ad in a recent issue of Poker Player newspaper. I was impressed by its honesty. 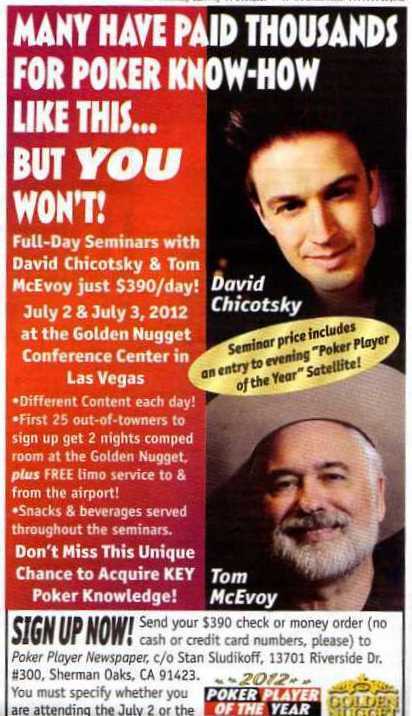 It says, "Many have paid thousands for poker know-how like this... but YOU won't!" And they're absolutely right--I won't! We have us a winner! Congratulations, "what is 7x6"! In addition to the free Stars bucks and bragging rights, you have won an entry into the inaugural $1,000,000 buy-in bracelet event at this year's World Series of Poker! Please remit the $999,999 processing fee to me at your earliest convenience, and I will take care of getting you registered. Thanks for showing up and entertaining me, all. 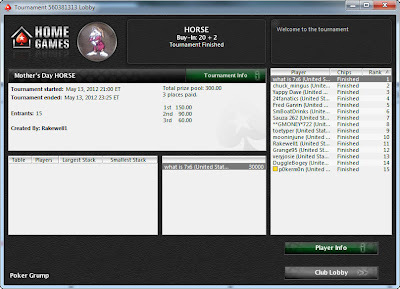 I just had, and yielded to, an impulse to create a HORSE tournament tonight for my PokerStars home game club (ID# is 383761, invitation code "playgrumpy"). No real money involved, obviously--just 20 fake dollars and bragging rights are at stake. 9:00 p.m. EDT, 6:00 p.m. PDT. 1. You are now or at some point in the past have been a mother. 2. You now have or at some point in the past have had a mother. 3. You are now or at some point in the past have been a horse. Please note that this requirement will be very strictly enforced, with no exceptions made.